Right now, the room holds little more than a photo studio. For carrots. But if Edgar Spalding has his way, this room by the loading dock of the Wisconsin Crop Innovation Center in Middleton, Wisconsin, will someday soon be a hub for biologists, engineers and agronomists to collaborate on improving crops — by measuring them. Spalding, a botanist at the University of Wisconsin–Madison, wants to help bring the science of assessing plants’ traits, known as phenotyping, up to par with the revolution in genomic data, which is easier than ever to analyze. A UW2020 initiative, the phenotyping center at the WCIC aims to develop new ways to measure plants and address novel questions about what factors influence crop performance. Just as every organism has a genotype — its collection of genes — so too it has a phenotype, the expression of those genes in the environment. Your phenotype includes your height and eye color; corn’s phenotype includes its number of ears and the size of kernels on those ears. Some traits, like yield, are relatively easy to measure. Others, such as the extent of the root system, are much more difficult to get at. Many phenotypes are time-consuming and labor-intensive to measure, limiting the information that crop breeders have when trying to develop better crops. Increasingly affordable troves of genomic data have given crop scientists more information than ever about the genetic traits that lead to prolific crops. But without being able to tie those genes to equally large data sets about the plant’s diverse set of traits, DNA sequencing only tells half the story. Nathan Miller, originally from Shawano, Wisconsin, earned a B.S. degree in electrical and computer engineering from UW–Madison before deciding to turn his attention to the biological world. He earned his doctorate in biomedical engineering in the Spalding lab developing machine vision systems that can process large amounts of visual data and extract details about a plant’s phenotype. His software is currently analyzing images of thousands of ears of corn, grown at the West Madison Agricultural Research Station, to measure the size of the ears, cobs, and kernels. 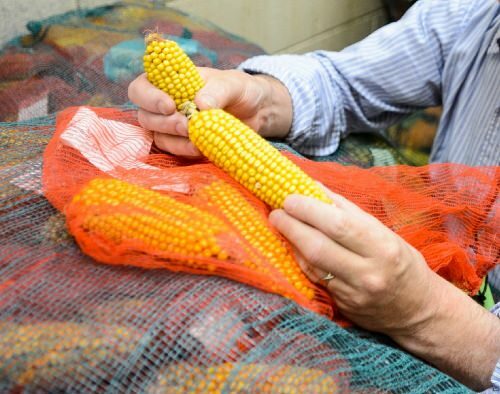 Researchers can then tie this information back to genetic data about the corn that produced those ears, to better understand how genes become corn kernels. 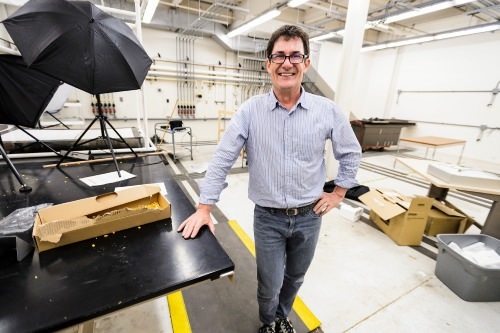 Meanwhile, the research team of Phil Simon, a professor of horticulture at UW–Madison, is using the photo studio to capture hundreds of images of carrot tops and roots. Using Miller’s software, Simon’s group is measuring the size and shape of the carrot roots and how widely the tops spread, which could help breeders develop carrots that shade out weeds more effectively. If Edgar Spalding has his way, the room will be a hub for biologists, engineers and agronomists to collaborate on improving crops — by measuring them. For now, students help manually capture the images of corn and carrots before they are analyzed. But Spalding is working with Madison College robotics instructors Rick Jacobs and Peter Dettmer to establish the WCIC phenotyping center as an internship opportunity for students who could help develop automation systems to speed up the process further. Spalding wants the WCIC phenotyping center to be a more nimble and responsive alternative to expensive and one-size-fits-all phenotyping centers sold by companies. Individuals and research groups will be able to consult with Spalding, Miller, WCIC director Shawn Kaeppler and others to develop custom equipment and protocols to address new questions about crop growth and performance. The funds from the UW2020 program are supporting researcher salaries and the purchase of a hyperspectral camera. This camera will be able to image visible and infrared light across a broad spectrum, capturing subtle information about the chemical makeup of the plants, which usually goes unmeasured. This analysis could discover new patterns that can predict which crops will be the most productive.